Whether you’re a newbie or have been on the scene for a hot minute, you’re coming to Aloha for the ØNO Grinds (Slang for delicious food). Allow us to guide you to a super tasty bowl with these ‘Pro Tips’ created to help you combine the ingredients you love to get that WOW factor you crave! The solution: ask for a ‘Big’ sized portion in a ‘Kahuna’ sized bowl or ‘Big-in-a-Kahuna’. 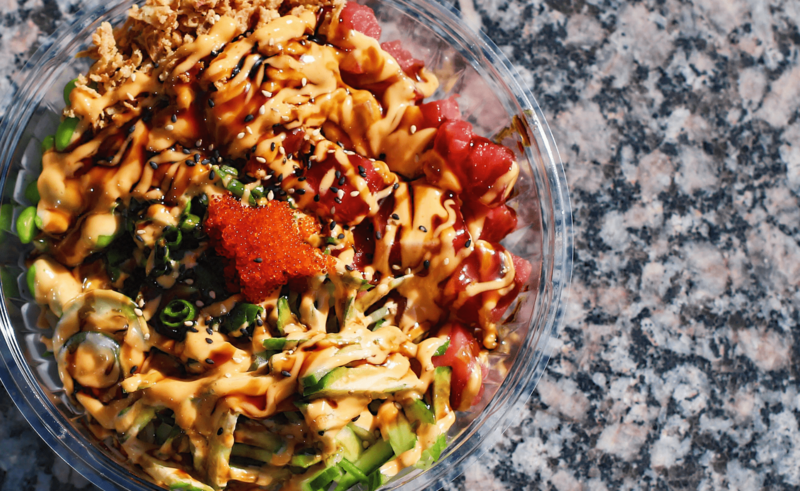 That way, you can shake and mix around your pokē combining all the deliciousness into one heaping pile of awesome. You’ll have enough room so your pokē bowl can party…and who knows, there may be just enough room for you to join in with your food as well. Much of the secret to our good eats lies in the sauce. Here at APC, we have designed our sauces with experts to give specific flavor profiles: spicy, zesty, sweet, citrusy & nutty. You may be afraid to go outside of your comfort zone but why? Most sauces mix well together, especially when you combine one mayo based sauce with another non-mayo based sauce. Our favorite, you ask? Try the Spicy Aioli & Samurai, which is the featured combo of our Crunch Bowl. You’ll get a lovely combo of creamy zesty and sweet teriyaki. Need Spicy? The volcano sauce is the jam. Or ask for our Wasabi Sauce on the side. In a post recession world, we are constantly seeking the biggest bang for our buck. This is why most eyes gravitate towards our ‘808’ menu option. Don’t get us wrong, it’s killer…all of the ingredients and flavors blending together for a pokē fiesta in your mouth! But there’s something about a Less-is-more strategy, especially if you’re someone who struggles to navigate the jungle that is an 808 bowl. We think you’ll find that 3 or 4 ingredients with 1-2 sauces makes a world of difference. 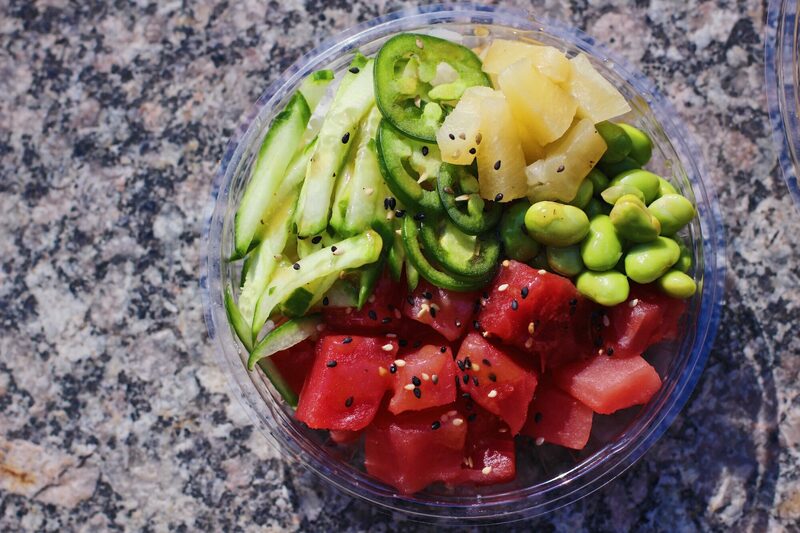 Are you looking to take your pokē game to the next level? We always are. Our location at the Revival Food Hall is concocting some serious food science, Bill Nye style. We like to make some of our hidden favorites for pre-shift meals. Although we don’t do tacos and we’re not a korean joint, we’re cooking up what we like to call ‘Fire rice’. You want to take your bowl from zero to hero? It’s sweet, nutty, creamy and quite honestly, the perfect base. Inquire in the early or late hours at Revival Food Hall and when your jaw drops, we know it’s because you fell instantly in love with our creation. 5 (MOST IMPORTANT): Have fun! Food is fun, period. We love kidding around and creating our ‘Aloha’ environment around jokes, good times, stories and all other shenanigans. If you’re having a hard day, let us know. We’ll accommodate you and talk a little smack about that boss of yours who is kicking you in your knickers. We want you all to feel comfortable with us so we’re not just another ‘place’ you pick up your food from. You’re our culture, you make our brand.